FIBARO Switch2 is a Security Enabled Z-Wave Plus product and a Security Enabled Z-Wave Controller must be used in order to fully utilize the product. Electrical appliances which power consumption does not exceed the limit for a specified device. Applied load and the Switch 2 itself may be damaged if the applied load is inconsistent with the technical specifications! Do not connect loads greater than those recommended! Do not connect types of load other than resistive or incandescent! IEC certification applies in EU countries and most countries using 220-240V~. UL certification applies in United States and most countries using 100-120V~. Radio frequency of individual device must be same as your Z-Wave controller. Check information on the box or consult your dealer if you are not sure. Connecting the device in a manner inconsistent with manual may cause risk to health, life or material damage. Length of wires used to connect the control switch should not exceed 10m. Switch off the mains voltage (disable the fuse). Open the wall switch box. Connect with one of the diagrams below for appropriate device. After verifying correctness of the connection switch on the mains voltage. Add the device to the Z-Wave network. Turn off the mains voltage, then arrange the device and its antenna in a wall switch box. Close the wall switch box and turn on the mains voltage. Switch connected to the S1 terminal is a master switch. It activates the basic functionality of the device (turning the first load on/off) and activates the learning mode (adding/removing). The switch connected to the S2 terminal turns on/of the second load in Double Switch 2, but is optional in Single Switch 2 and pushing it will not affect the status of the device. Locate the antenna as far from metal elements as possible (connecting wires, bracket rings, etc.) in order to prevent interferences. Metal surfaces in the direct vicinity of the antenna (e.g. flush mounted metal boxes, metal door frames) may impair signal reception! Do not cut or shorten the antenna – its length is perfectly matched to the band in which the system operates. Place the Switch 2 within the direct range of your Z-Wave controller. Set the main controller in (security/non-security) add mode (see the controller’s manual). Quickly, three times press the S1 switch. While adding the Switch 2 to the network with connected toggle switch, ensure that switch contact is open (off). Otherwise it will prevent adding/removing the device to/from the network. Adding in security mode must be performed up to 2 meters from the controller. 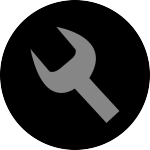 Removing the device from the Z-Wave network restores all the default parameters of the device. The Switch 2 has a built in Z-Wave network main controller’s range tester. Remove the Switch 2 from the wall switch box. Switch on the mains voltage. Press and hold the B-button to enter the menu. Wait for the visual LED indicator to glow violet. Quickly release and click the B-button again. To exit Z-Wave range test, click the B-button. Visual indicator pulsing green – the Switch 2 attempts to establish a direct communication with the main controller. If a direct communication attempt fails, the device will try to establish a routed communication, through other modules, which will be signalled by visual indicator pulsing yellow. Visual indicator glowing green – the Switch 2 communicates with the main controller directly. Visual indicator pulsing yellow – the Switch 2 tries to establish a routed communication with the main controller through other modules (repeaters). Visual indicator glowing yellow – the Switch 2 communicates with the main controller through the other modules. After 2 seconds the device will retry to establish a direct communication with the main controller, which will be signalled with visual indicator pulsing green. Visual indicator pulsing violet – the Switch 2 does communicate at the maximum distance of the Z-Wave network. If connection proves successful it will be confirmed with a yellow glow. It’s not recommended to use the device at the range limit. Visual indicator glowing red – the Switch 2 is not able to connect to the main controller directly or through another Z-Wave network device (repeater). Communication mode of the device may switch between direct and one using routing, especially if the device is on the limit of the direct range. Change the state of 2nd, 3rd (S1 switch), 4th and 5th (S2 switch) association group to the opposite one. Set maximum level of devices associated in 2nd, 3rd (S1 switch), 4th and 5th (S2 switch) group. Start smooth control of devices associated in 3rd (S1 switch) and 5th (S2 switch) group. Stop smooth control of devices associated in 3rd (S1 switch) and 5th (S2 switch) group. Turn ON devices associated in 2nd, 3rd (S1 switch), 4th and 5th (S2 switch) group. Turn OFF the connected load (S1switches 1st channel, S2switches 2nd channel). Turn OFF devices associated in 2nd, 3rd (S1 switch), 4th and 5th (S2 switch) group. 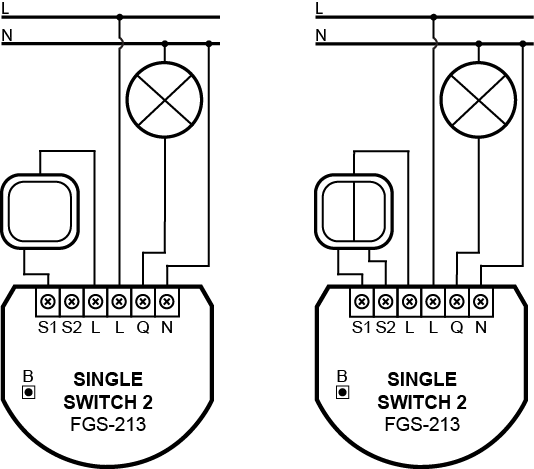 Operates as a two-position switch, it has no spring that would set one position of the switch. State of the device is synchronized with state of the external toggle switches. State of the device is reversed with every change in state of the external toggle switch. Cancel alarm mode (flashing alarm). Select desired menu position (if menu is active). Send the Node Info Z-Wave command frame (adding/removing). Enter the menu (confirmed by the LED indicator). Reset procedure allows to restore the device back to its factory settings, which means all information about the Z-Wave controller and user configuration will be deleted. Wait for the visual LED indicator to glow yellow. After few seconds the device will be restarted, which is signalled with the red LED indicator colour. The Switch 2 can activate scenes in the Z-Wave controller by sending scene ID and attribute of a specific action using Central Scene Command Class. By default scenes are not activated, set parameters 28 and 29 to enable scene activation for selected actions. The Switch 2 allows for the active power and energy consumption monitoring. Data is sent to the main Z-Wave controller, e.g. Home Center. Measuring is carried out by the most advanced micro-controller technology, assuring maximum accuracy and precision (+/- 1% for loads greater than 5W). The Switch 2 require the power consumption of connected load equal to 5W or greater to correctly measure the power and energy. Power measurement can contain mains voltage fluctuations within +/- 10%. The Switch 2 stores periodically (every hour) the consumption data in the device memory. Disconnecting the module from the power supply will not erase stored energy consumption data. Using functionality of a Z-Wave controller (see the controller’s manual). Wait for the visual LED indicator to glow green. Energy consumption memory will be erased. 2nd association group – “On/Off (S1)” is assigned to switch connected to the S1 terminal (uses Basic command class). 3rd association group – “Dimmer (S1)” is assigned to switch connected to the S1 terminal (uses Switch Multilevel command class). 4th association group – “On/Off (S2)” is assigned to switch connected to the S2 terminal (uses Basic command class). 5th association group – “Dimmer (S2)” is assigned to switch connected to the S2 terminal (uses Switch Multilevel command class). The Switch 2 in 2nd to 5th group allows to control 5 regular or multichannel devices per an association group. “LifeLine” group is reserved solely for the controller and hence only 1 node can be assigned. The Switch 2 allows to customize its operation to user’s needs. The settings are available in the FIBARO interface as simple options that may be chosen by selecting the appropriate box. This parameter determines if the device will return to state prior to the power failure after power is restored. This parameter allows to choose operating for the 1st channel controlled by the S1 switch. When parameter 10 value is set to 5, then parameter 11 value must be set to 0. This parameter determines how the device in timed mode reacts to pushing the switch connected to the S1 terminal. This parameter allows to set time parameter used in timed modes. This parameter allows to set time of switching to opposite state in flashing mode. This parameter allows to choose operating for the 1st channel controlled by the S2 switch. When parameter 15 value is set to 5, then parameter 16 value must be set to 0. This parameter determines how the device in timed mode reacts to pushing the switch connected to the S2 terminal. This parameter defines as what type the device should treat the switch connected to the S1 and S2 terminals. This parameter allows to define if the device sends reports during the flashing mode. Parameter 27 values may be combined, e.g. 1+2=3 means that 2nd & 3rd groups are sent as secure. This parameter determines which actions result in sending scene IDs assigned to them. Parameter 28 values may be combined, e.g. 1+2=3 means that scenes for single and double click are sent. Parameter 29 values may be combined, e.g. 1+2=3 means that scenes for single and double click are sent. This parameter determines which actions are ignored when sending commands to devices associated in 2nd and 3rd association group. All actions are active by default. Parameter 30 values may be combined, e.g. 1+2=3 means that associations for turning ON and OFF are not sent. *Hold and release is inactive when parameter 20 is set to 1 or 2. **Double click is inactive when parameter 20 is set to 1. This parameter defines value sent with Switch ON command to devices associated in 2nd and 3rd association group. This parameter defines value sent with Switch OFF command to devices associated in 2nd and 3rd association group. This parameter defines value sent with Double Click command to devices associated in 2nd and 3rd association group. This parameter determines which actions result in sending commands to devices associated in 4th and 5th association group. All actions are active by default. Parameter 35 values may be combined, e.g. 1+2=3 means that associations for turning ON and OFF are not sent. This parameter defines value sent with Switch ON command to devices associated in 4th and 5th association group. This parameter defines value sent with Switch OFF command to devices associated in 4th and 5th association group. This parameter defines value sent with Double Click command to devices associated in 4th and 5th association group. This parameter determines how the device will react to General Alarm frame. This parameter determines how the device will react to Flood Alarm frame. This parameter determines how the device will react to CO, CO2 or Smoke frame. This parameter determines how the device will react to Heat Alarm frame. This parameter allows to set duration of flashing alarm mode. This parameter determines the minimum change in consumed power that will result in sending new power report to the main controller. This parameter determines minimum time that has to elapse before sending new power report to the main controller. This parameter determines the minimum change in consumed energy that will result in sending new energy report to the main controller. This parameter determines in what time interval the periodic power reports are sent to the main controller. This parameter determines in what time interval the periodic energy reports are sent to the main controller. This parameter determines whether energy metering should include the amount of energy consumed by the device itself. Results are being added to energy reports for first endpoint. 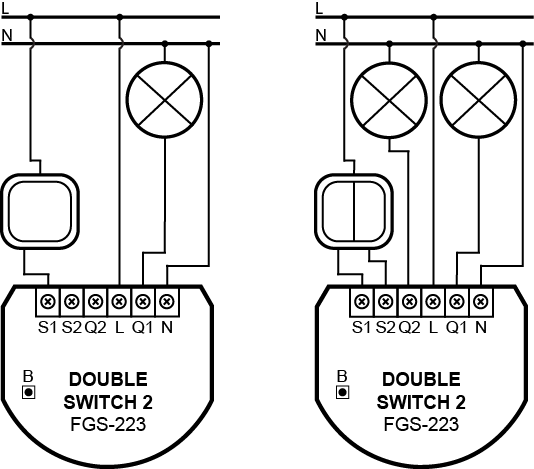 1.What is a Single/Double Switch 2 module? FIBARO Single/Double Switch 2 is a wireless module designed to operate in a wall switch box or in locations where the control of an electric device is needed. 2. What voltage Single/Double Switch 2 module should be powered by? The Single/Double Switch 2 should be connected to 110-240V AC (50/60Hz). 3. What are the differences between Single and Double Switch? 4. What voltage can be controlled by modules output? FIBARO Single/Double Switch cannot control the output directly. The module simply closes the electrical circuit (or two circuits if it’s a Double Switch) so devices connected to this electrical network turns on (or off on relay interruption). 5. Can this module be DC supplied? No, only the previous generation of the device was able to do so. However, you can check other FIBARO devices if they are suitable for your needs. 6. I want to control the lighting but I do not have Neutral wire. Can I connect Single/Double Switch 2 to such circuit? No, FIBARO Single/Double Switch needs to be connected to Neutral Wire. To control circuits where there is no Neutral wire at the switch, please refer to the FIBARO Dimmer module. 7. Can I control non-potential output by the Single/Double Switch 2 module? 8. What are association groups 1, 2, 3, 4 and 5 for? Group 1 is assigned to Lifeline, Groups 2 and 3 are assigned to S1 (On/Off, Dimmer, respectively) and Groups 4 and 5 are signed to S2 (On/Off, Dimmer, for second switch). 9. What are S1 and S2 for? These terminals are designed to be connected to the switch. In FIBARO Double Switch, S1 is designed to control Q1 output, S2 to control Q2 output. In FIBARO Single Switch, S1 is designed to control output Q, and S2 can be used for scene activation. 10. Is the wall switch needed to control the lights via FIBARO Single/Double Switch? No, you don’t need a wall switch. You can control the connected source of light via the FIBARO Home Center (in the app or the web browser). In this case, don’t connect the S1 and S2 terminals. You can also set up FIBARO Motion Sensor to activate the lights when motion detected.